Consultant, choreographer, dancer and teacher, specializing in flamenco. Member off International Dance Council CID (UNESCO). Cécile Apsâra’s work is rooted first in Paris in the world of culture in the 60s and 70s, then to Madrid and Seville in the flamenco. Fascinated by the theatrical aspect of this extraordinary art, she studied fully in Spain with the greatest artists. Accepted and integrated into several families of gypsy artists (Pedro Bacan, Angelita Vargas, Rafael Amador, PATA NEGRA), she delves into the life and customs of a country in order to understand the heart of this culture. She was a member of several dance companies including with Antonio Gades. 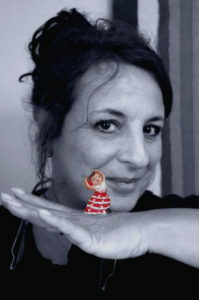 Flamenco being in the heart of her work, Cécile Apsâra has created many performances combining tradition and modernity. 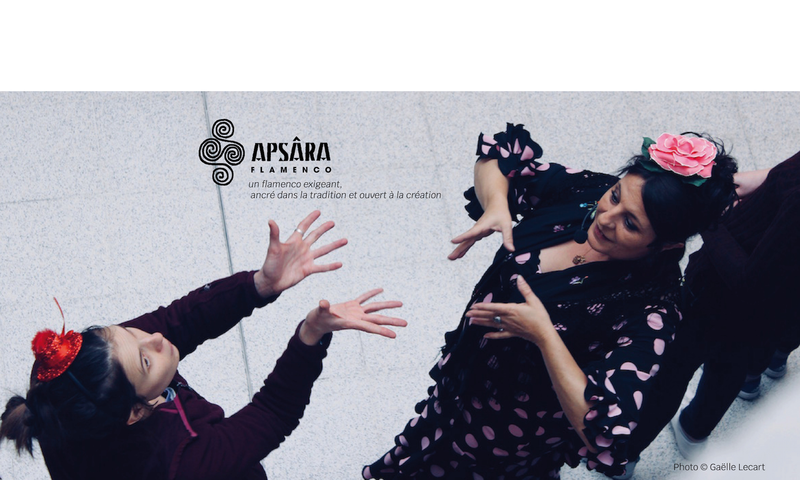 Moreover, Cécile Apsara is very anxious to preserve the transmission of traditional repertoire flamenco, which remains the source of all creation and is part of a living heritage. She offers a conference / show for a discovery of the flamenco art through images, music and dance. Based in Rennes since 2000, her experience as an educator has developed increasingly, she has trained musicians, amateur dancers and professionals thus creating a new and loyal public in the Brittany territory. Cécile Apsâra’s flamenco : strength, endurance, a shared living experience. Flamenco is a great way to express anger and frustration. It denounces all the injustices and represents for Cécile strength and resistance, a way of asserting their dignity. Born in Paris into a family of musicians – her great-grandfather, pianist and composer Edouard Risler, her uncle Jean-Charles François, contemporary music composer and her mother Anne-Marie Francis, pianist, both playing with all Live music, Mauricio Kagel, Jean-Pierre Drouet … – very young Cécile Apsara begins to explore various art forms (music, dance, painting). She began ballet at the age of 7 at the Schola Cantorum and practiced African dance and aikido. In 1989, she obtained her Masters in Theatre Studies at the University of Paris III under the direction of Anne Ubersfeld. It starts in the theatre THESE PEOPLE WHO LIVE IN HOUSES OF GLASS alongside artists such as Mark Tompkins, with the Théâtre Autarcique in festivals off Nancy in 1979, Saarbrücken (Germany) and Polverrigi (Italy) in 1980. She worked in two Carolyn Carlson creations : 1988 in DARK as an assistant designer for Frederic Robert, and STEPPE in 1990 as an assistant costume designer. With flamenco at the heart of her work, the choreographer crosses theatre, dance, music, visual arts without ceasing to relate to the concerns and realities of today’s world. SOLEA DE LA DAMA (founded in 1996 – Seville): an intimate adaptation of the Lady of the Camellias. SECRET ARIA (1997 – Seville): a flamenco facing working women in contemporary society. This piece represents the young Andalusian creation for the first time Choreographic Encounters Madrid Albeniz Theatre in 1997 and was highly acclaimed at the Théâtre Mogador in Paris in 2000 as part of the Festival Estival danse. PASSION With ARIA (2005 – Rennes) her research has focused on following the show SECRET ARIA, especially with the great master Manuel Soler with whom she created a rhythmic drawings show.  Bringing Rennes, Paris and Andalusian artists PASSION ARIA was established in 2005 in St Avertin near Tours (37) South Pole in Chartres de Bretagne (35) and Square-Sevigne Cesson (35). 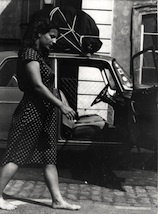 In 2006, she worked with actor Guillaume Doucet, guitarist Steven Fougères and percussionnist Jean-Marie Nivaigne using a Mérimée letter and later, the painter Nicolas de Staël. This meeting produced the creation of the shows HIGHWAY FLAMENCO and ENTRE TIERRA Y CIELO shown at the Museum of Fine Arts of Rennes and Théâtre de la Paillette in June 2006. The Festival Scriludes managed this. Between 2012 and 2015, Cécile Apsara worked on a solo contemporary flamenco, SOL that she experiments in various places: dance studios, coffees, museums, gardens, and in a festival of poetry. In 2016, she created with Véronique Bouvet, a danced tale flamenco, OMA Cinderella’s ” too ” wonderful story which approaches themes such the modern slavery, the migration and the discrimination and thereby, the very present questions of pluralism, feminism and brotherhood. The opportunity for her to evoke its own route, its relation in the flamenco and its various expressions under a new, hard-hitting, committed and funny angle. Help to the direction: Rozenn Tregoat. She creates various cultural activities in collaboration with cultural centres, middle schools, retirement homes, etc. ¿FLAMENCO? (2005 – Rennes) : Show conference for discovery of the flamenco art through images, music and dance. Available in English, French and Spanish. 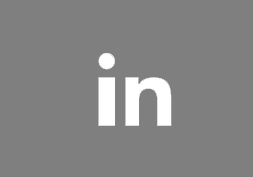 Represented in various venues: festivals, community centres, retirement homes, neighbourhood parties, private parties, cabarets … since 2009 to date. (Creation Theatre Festival at the Theatre des Jacobins, Dinan (22). Festival Rendez-vous Conte, Quimper, 2011 Rennes stadium, 2011, etc.). Participatory dance. 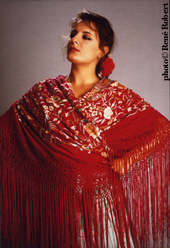 Cécile Apsara dancer and choreographer invents and transmits a flamenco madison. Under CIRQUE OU PRESQUE the INTERVALLE Noyal-sur-Vilaine (35), after Charmatz contemporary madison and Olivier Férec burlesque madison. TELL ME THE FREEDOM ! (2017 – Rennes): An action emancipator where the entertainment, the artistic and the politic rub shoulders. LAS CARMEN (2008 – Rennes): a flamenco show with over a hundred students Apsara Flamenco workshops and a dozen professional artists. The Triangle, dance city in Rennes, 7 and 8 July 2008. ANDA JALEO (2012 – Rennes) : a flamenco show around the civil war in Spain in 1936 with students APSÂRA Flamenco workshops. Triangle, dance city in Rennes, July 2012. 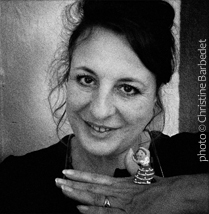 Cécile Apsâra will share her artistic experience and her knowledge of the flamenco culture with different artists. Based in Rennes, in 2001, she was responsible for the choreography of the show VAGABONDES ROOTS presented at Theatre of Vieux St Etienne in Rennes, show where she was both dancer and rider. Since 2003, she has created and performed flamenco choreographies on brttany music with the group KENDIRVI. Cécile Apsâra is also facing the animation by creating choreography for the film LE CID‘s Emmanuelle Gorgiard music by Titi Robin. She has contributed to bringing her expertise to train facilitators puppets, record the sounds of the feet and hands and help design the postures and movements to make “flamenco”. This film was broadcast on ARTE in October 2006. In 2010, she collaborated with Stéphanie d’Oustrac, opera singer, for the preparation of lead in CARMEN directed by Jean-François Sivadier at the Opera de Lille. 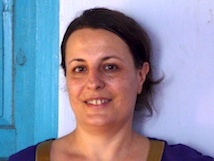 Cécile Apsâra moves forward with passion and precision the expression of knowledge learned throughout her experience. Her pedagogy borrows from other disciplines breathing techniques, stretching and appropriate investments, awareness of the body and its movements. In addition, she has developed a musical ear and sense of rhythm by listening exercises and practice of percussion and singing. Finally, she uses her expertise in theatre to develop the interpretation. One goal of the course is to implement acquired skills by the pleasure of dance and improvisation in festive gatherings. Conseillère, chorégraphe, danseuse et enseignante, spécialisée dans le flamenco. Membre de l’International Dance Council CID (UNESCO). Le travail de Cécile Apsâra prend racine d’abord à Paris dans l’univers de la culture des années 60/70, puis à Madrid et Séville dans celui du flamenco. Fascinée par l’aspect théâtral de cet art extraordinaire, elle l’étudie pleinement en Espagne auprès des plus grands artistes. Acceptée et intégrée dans plusieurs familles d’artistes gitans (Pedro Bacan, Angelita Vargas, Rafael Amador PATA NEGRA ), elle se plonge dans la vie et les coutumes d’un pays afin d’en comprendre l’essence. Elle a été membre de plusieurs compagnies dont celle d’Antonio Gades. Avec le flamenco au cœur de son travail, Cécile Apsâra a créé de nombreux spectacles alliant tradition et modernité. En outre, Cécile Apsâra est très soucieuse de préserver la transmission du répertoire traditionnel flamenco, qui reste à la source de toute création et fait partie d’un patrimoine vivant. Elle propose un spectacle conférence pour une découverte de l’art flamenco à travers l’image, la musique et la danse. Installée à Rennes depuis 2000, pionnière dans ce domaine, son expérience de pédagogue s’est développée de façon croissante. Elle a formé des musiciens et danseuses amateurs et professionnels et a fidélisé un nouveau public sur le territoire breton. Le flamenco est un moyen extraordinaire d’exprimer sa colère et sa frustration. Il dénonce toutes les injustices et représente pour Cécile la force et la résistance, un moyen d’affirmer sa dignité. Née à Paris, dans une famille de musiciens — son arrière grand-père le pianiste et compositeur Edouard Risler, son oncle Jean-Charles François, compositeur de musique contemporaine et sa mère Anne-Marie François, pianiste, tous deux jouant avec l’ensemble Musique Vivante, Mauricio Kagel, Jean-Pierre Drouet… — très jeune, Cécile Apsâra commence à explorer divers moyens d’expression artistique (musique, danse, peinture). Elle commence la danse classique à l’âge de 7 ans à la Schola Cantorum, puis pratique la danse africaine et le aïkido. En 1989, elle obtient avec mention très bien sa Maîtrise d’Etudes Théâtrales sur “la figure de la courtisane dans le théâtre de la 1ère moitié du XIXè siècle”, à l’Université de Paris III sous la direction d’Anne Ubersfeld. Elle débute au théâtre dans le spectacle CES GENS QUI HABITENT DANS LES MAISONS DE VERRE aux côtés d’artistes tels que Mark Tompkins, avec le Théâtre Autarcique dans les festivals de Nancy en 1979, de Sarrebrück (Allemagne) et de Polverrigi (Italie) en 1980. Elle travaille dans deux créations de Carolyn Carlson: en 1988, dans DARK en tant qu’assistante scénographe de Frédéric Robert, et dans STEPPE en 1990, en tant qu’assistante costumière. En 1986, c’est en Espagne, à Madrid mais surtout à Séville qu’elle part chercher l’esprit et la pratique de l’enseignement du flamenco auprès des grands maîtres pendant plus de dix ans : Angel Torres, Carmen Cortes, Ciro, Farruco, Juana Amaya, Manolo Marin, Angelita Vargas… Sa rencontre avec Antonio Gades lui a apporté la rigueur et la discipline de la direction de ballet ainsi que la connaissance du répertoire traditionnel et contemporain du ballet flamenco. Avec le flamenco au cœur de son travail, la chorégraphe croise théâtre, danse, musique, art plastique sans cesser de les relier aux inquiétudes et aux réalités du monde actuel. SOLEA DE LA DAMA (création en 1996 – Séville) : une adaptation intimiste de la «Dame aux Camélias». SECRET ARIA (1997 – Séville) : un flamenco aux prises avec la femme au travail dans la société contemporaine. Cette pièce représente la jeune création andalouse pour la première fois aux Rencontres Chorégraphiques de Madrid au Théâtre Albeniz en 1997 et fut très applaudie au Théâtre Mogador à Paris en 2000 dans le cadre du Festival Les Estivales de danse. Avec PASSION ARIA (2005 – Rennes) sa recherche s’est concentrée sur la suite du spectacle SECRET ARIA, en particulier avec le grand maître Manuel Soler avec qui elle crée les dessins rythmiques du spectacle. Réunissant artistes rennais, parisiens et andalous, PASSION ARIA a été créé en 2005, à St Avertin à côté de Tours (37), Pôle Sud à Chartres de Bretagne (35) et au Carré-Sévigné à Cesson-Sévigné (35). En 2006, elle travaille avec le comédien Guillaume Doucet, le guitariste Steven Fougères et le percussionniste Jean-Marie Nivaigne autour d’une lettre de Mérimée puis autour de celles du peintre Nicolas de Staël. Cette rencontre a produit la création des spectacles FLAMENCO DE GRAND CHEMIN et ENTRE TIERRA Y CIELO représenté au Musée de Beaux-Arts de Rennes et au Théâtre de la Paillette en juin 2006. Commande du Festival Les Scriludes. 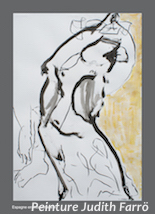 Entre 2012 et 2015, Cécile Apsâra a travaillé sur un solo de flamenco contemporain SOL qu’elle expérimente dans différents lieux : studios de danse, cafés, musées, jardins, et dans divers cadres : festival de poésie, Portes ouvertes d’Ateliers d’artistes, etc. Portée par le pas des ancêtres, la danseuse interroge la danse sociale pour enfin naître à elle-même, dans le mouvement de la force intérieure. En 2016, elle a créé avec Véronique Bouvet, un conte dansé flamenco, OMA la “trop” merveilleuse histoire de Cendrillon qui aborde les thématiques telles l’esclavagisme moderne, la migration et la discrimination et par là même, les questions bien présentes de pluralisme, féminisme et fraternité. L’occasion pour elle d’évoquer son propre parcours, sa relation au flamenco et ses différentes expressions sous un angle nouveau, percutant, engagé et comique. Regard extérieur : Guillaume Doucet. Aide à la mise en scène : Rozenn Tregoat. Elle invente diverses actions culturelles originales en collaboration avec des centres culturels, collèges lycées, maisons de retraite, etc. ¿FLAMENCO? (2005 – Rennes) : Spectacle-conférence pour une découverte de l’art flamenco à travers l’image, la musique et la danse. Disponible en français, en anglais et en espagnol. Représenté dans divers lieux : festivals, centres socioculturels, maisons de retraite, fêtes de quartier, soirées privées, cabarets… depuis 2009 à ce jour. (Création au Festival Théâtre en Rance au Théâtre des Jacobins à Dinan (22). MADISON FLAMENCO (2012 – Noyal sur Vilaine) : danse participative. Cécile Apsâra, danseuse et chorégraphe, invente et transmet un madison flamenco. Dans le cadre de CIRQUE OU PRESQUE à l’INTERVALLE de Noyal-sur-Vilaine(35), après Boris Charmatz et son madison contemporain, Olivier Férec et son madison burlesque. CONTE-MOI LA LIBERTE ! (2017 – Rennes) : une action émancipatrice où le divertissement et le politique se côtoient, une expérience à renouveler dans d’autres villes. LAS CARMEN (création en 2008 à Rennes) : un spectacle de flamenco avec plus d’une centaine d’élèves des ateliers d’APSÂRA Flamenco et une dizaine d’artistes professionnels. Le triangle, cité de la danse à Rennes. 7 et 8 juillet 2008. ANDA JALEO (création 2012 à Rennes) : un spectacle de flamenco autour de la guerre civile de 1936 en Espagne avec les élèves des ateliers d’APSÂRA Flamenco. Le triangle, cité de la danse à Rennes, juillet 2012. Cécile Apsâra va partager son expérience artistique et sa connaissance de la culture flamenca avec différents artistes. Installée à Rennes, en 2001, elle est chargée de la chorégraphie du spectacle RACINES VAGABONDES de Patrick Massé présenté au Vieux St Etienne à Rennes, spectacle où elle est à la fois danseuse et cavalière. Depuis 2003, elle crée et interprète des chorégraphies flamenco sur musique bretonne avec le groupe KENDIRVI, notamment dans le cadre de Yaouank sur la scène du Liberté (2004) ou au Festival Bol d’Eire, (2007). Cécile Apsâra s’est aussi tournée vers le cinéma d’animation en créant une chorégraphie pour le film LE CID d’Emmanuelle Gorgiard sur une musique de Titi Robin. Elle y a contribué en apportant son savoir-faire pour former les animateurs des marionnettes, enregistrer les sons des pieds et des mains et aider à concevoir les postures et mouvements pour les rendre “flamencos”. Ce film a été diffusé sur la chaîne ARTE en octobre 2006. En 2010, elle collabore avec Stéphanie d’Oustrac, chanteuse lyrique, pour la préparation du premier rôle dans CARMEN mis en scène par Jean-François Sivadier à l’Opéra de Lille. Cécile Apsâra transmet avec passion et justesse l’expression d’un savoir appris tout au long de son expérience. Sa pédagogie emprunte à d’autres disciplines des techniques de respiration, d’étirements et de placements appropriés à la prise de conscience du corps et de ses mouvements. De plus, elle développe l’oreille musicale et le sens du rythme par des exercices d’écoute et de pratique de la percussion et du chant. Enfin, elle se sert de son savoir-faire en théâtre pour développer l’interprétation. Un des buts de son enseignement est de mettre en œuvre ces acquis, par le plaisir de la danse et de l’improvisation au sein de rencontres festives. “Depuis la Bretagne, autre terre d’héritage, Cécile Apsâra sait par sa ténacité et son engagement tracer le sillon d’un flamenco exigeant, ancré dans la tradition et ouvert à la création. Sa rencontre avec le flamenco l’emmène, dès ses débuts, en Espagne au cœur de l’Andalousie. Par immersion, elle deviendra passeur, soutenue par ses maîtres.